Today’s FOMC meeting and press conference clarified to some degree how large the Fed intends to let its balance sheet grow under quantitative easing. Under the FOMC’s current economic outlook, the Fed intends to slow, before the end of the year, the pace of bond purchases from $85 billion per month and stop the purchases by the middle of next year. With the FOMC’s forecast for the unemployment rate around 7% in the middle of 2014, this also clarifies that the criterion for ending QE is explicitly different from the 6.5% unemployment criterion for the commitment to the zero interest rate policy. The impact of this new view can be assessed with the following chart of reserve balances (which I have used on this blog and in congressional testimony). To finance large-scale bond purchases, the Fed credits banks with these reserve balances (deposits at the Fed), so they closely track purchases under QE. The chart illustrates how unprecedented the Fed’s recent policy has been, not only compared with the response to the physical damage in 9/11/2001 but also in comparison with the liquidity provisions during the panic of 2008. The red line shows a projection consistent with the assumption that the $85 billion would continue until the unemployment rate hit 6.5 % (which until today was one interpretation of the “substantial labor market improvement” criterion) in which case tapering would have started in mid-2015. Note that this is essentially a continuation of the recent history (blue line). The black line shows a projection consistent with the new view that was expressed today. Although we still do not know what the degree of slowing will be, the chart assumes that the pace is cut in half (to $42.5 billion per month) in October and then to zero in the summer of 2014. 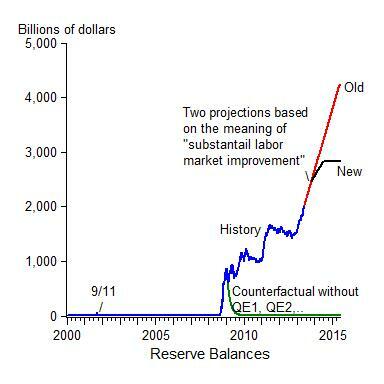 If this is what actually transpires, reserve balances will peak around $2.8 trillion rather than $4.2 trillion under the previous projection. That’s a big revision. Markets likely had already been assuming (at least since Bernanke’s Joint Economic Committee hearing a month ago) a tapering before the middle of 2015. Still that downward revision is larger than the total increase in reserve balances under QE3.